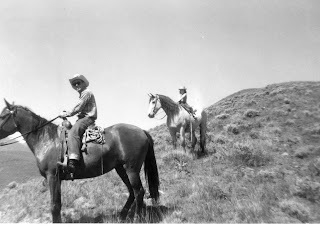 When I was 11 years old (in 1955), during the second summer my family lived in a little log cabin up Withington Creek, we unexpectedly became the owners of a second horse. We acquired that horse under unusual circumstances. My mom bought groceries at a little market in town, owned by friends named Capps, who also owned a ranch along the Salmon River. That spring the Capps were giving away a “palomino pony” in a sales promotion at their store. Everyone who bought groceries received a ticket for the drawing, each time they made a purchase. At the end of a certain period of time, all ticket stubs at the store were put into a large bowel and the winning number was drawn. That special number was posted in the store and mentioned in the local newspaper (this was before we had a radio station in Salmon), but no one came forth to claim the prize. One day my mom was in the store, and Mrs. Capps mentioned that they still hadn’t found the person with the winning ticket. Mom still had all her ticket stubs in her purse, but she’d never looked at them — because, in truth, she wasn’t interested in winning a horse. But she dug them out, and sure enough, she had the winning number. 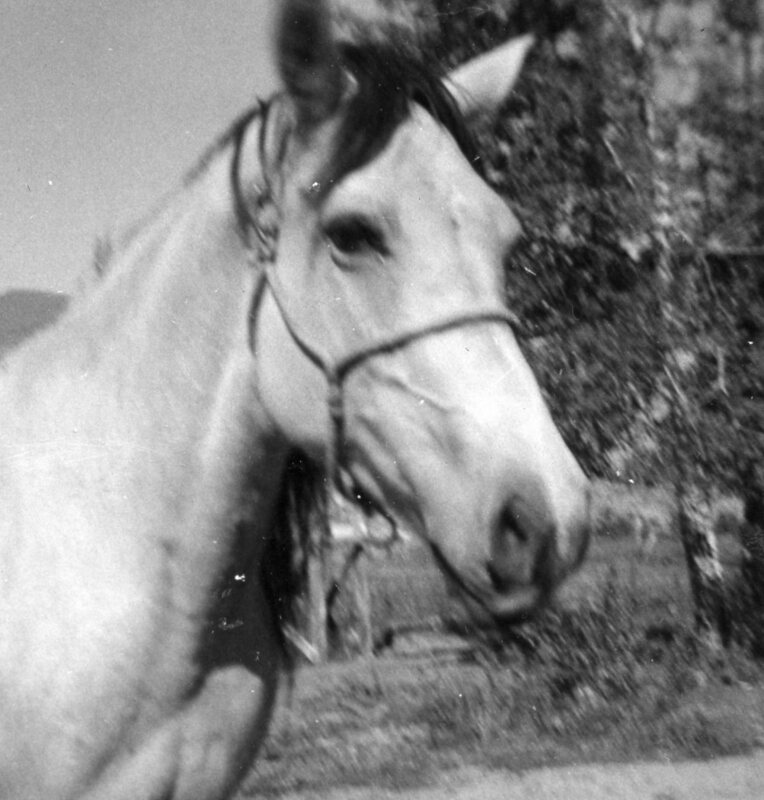 The horse we won turned out to be a large buckskin mare named Nosey. The intended “palomino pony” had drowned while crossing the river that spring during high water, and Nosey was a substitute. My dad borrowed a trailer to go get our new horse and bring her home. Nosey was very tall and a bit skittish, and she became quite nervous while riding in the trailer. It was a small, open-top trailer with sideboards, not a horse trailer, and when it started bouncing on the rough little jeep track up to our cabin, Nosey jumped out. Fortunately, my dad was driving very slowly, and Nosey wasn’t hurt when she leaped out of the trailer; she suffered only minor scrapes. Her head was still tied to the front of the trailer, however, and she was hanging there by the halter, seemingly about to choke. My little brother Rocky and I had been watching out the back window of our car, and we saw her leap over the side of the trailer. Nosey was a big, tall buckskin mare. We yelled at Dad, and he immediately stopped the car. We all jumped out and ran back to rescue Nosey. Rocky had a pocketknife (and struggled to get it quickly out of his pocket! ), and Dad used it to cut the rope and free the mare. She stood there shaking and trembling. We petted and talked to her, then let her eat some grass along the road to help calm her. Dad didn’t put her back into the trailer; we didn’t want to risk having her try to jump out again, so I led her the rest of the way to our cabin — about a mile and a half. Now my old horse Possum had a buddy. When I turned Nosey loose into his pasture, the old lazy gelding suddenly came to life and chased the big mare around and around. 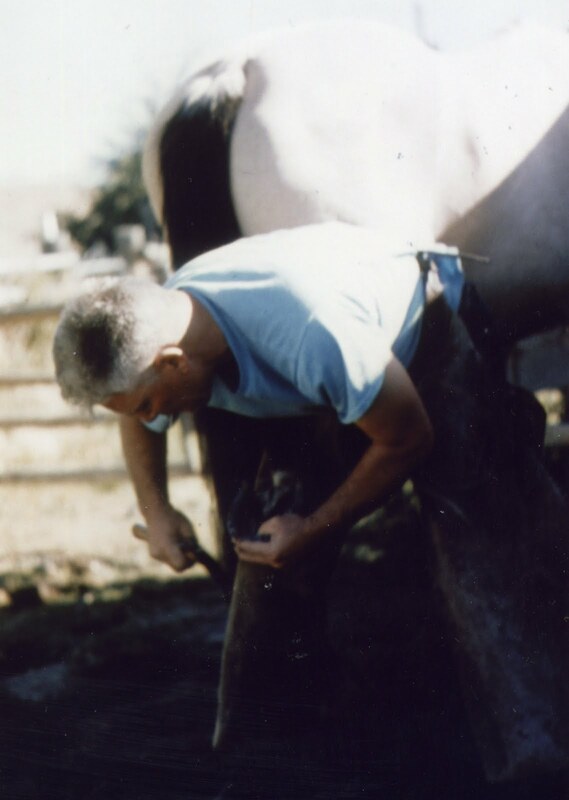 I was very worried and upset, afraid he might hurt her, but my dad explained that horses have to establish a “pecking order” to determine who is boss. Dad told me that once the horses figured it out, they’d get along fine. In a herd there’s always one horse who is boss, and the others stay out of his or her way, letting the boss eat the best food or drink first when they all go to water. The older horses usually boss the younger ones, and they all accept their place in the system, except when an aggressive younger horse moves up through the ranks and starts bossing some of the others. My dad was right. After Possum and Nosey had their fight and he chased her around and around our pasture and through the creek — and bit her on the rump a few times — they had it all settled. Possum was the boss and Nosey the meek follower. From then on they were best friends. Even though Possum had been very happy all those years living by himself, now that he had Nosey for a friend he wanted to be with her all the time; the two horses didn’t want to be separated. If we rode one of them and left the other one at home, the one left behind would whinny and run up and down the fence until the other horse returned. Nosey was a nervous individual, not as calm and gentle as old Possum. She’d grown up in the mountains and was surefooted and accustomed to wildlife but not very used to people. She didn’t like to be caught and was even worse about it than Possum had been when I first got him. I usually had to take a pan of grain out to the pasture to catch Nosey. Even then, she’d try to grab a bite of grain and jerk away. To catch her I’d have to slip a rope around her neck kind of sneakylike, then hold her there with the rope while I put the halter on. I didn’t dare leave a halter on her because there was too much brush and many other obstacles in the pasture that a halter could get caught on. I had to be patient, to try to outsmart Nosey, because she was often devious. One time I reached around her neck to slip the rope around it, and she spun away. I grabbed her long, black mane, but Nosey whirled away from me and bolted. I hung onto her mane for an instant, swinging wildly through the air with my feet nearly level with my head, then had to let go — rolling head over heels as the mare thundered away. who was riding Nosey), she always wanted to be near another horse. One day Rocky and I wanted to ride both horses and didn’t want to spend an hour trying to corner or outsmart Nosey, so we devised a plan to catch her more quickly. I set the pan of grain in the trail, and Rocky put a loop of rope (with a slipknot) on the ground around the pan. He took the other end of the rope and hid behind a big tree, tying his end of the rope to the tree. I stood back a ways and called the horses. Possum and Nosey came trotting down the trail. Seeing the pan of grain and no one close by to catch her, Nosey charged ahead, to get to the grain first. She grabbed a big bite, and as soon as one of her front feet was inside the loop of rope, Rocky pulled it tight with a jerk. When the rope tightened around her front pastern, Nosey was startled and leaped backward, then whirled around to gallop back up the trail. When she hit the end of the rope, Rocky’s knots held, and the mare crashed to the ground. She almost did a somersault when her front leg was suddenly pulled out from under her. She got up and stood there, stunned and shaken, as I quietly walked up and put the halter on her. Rocky and I were also a bit shaken. We hadn’t realized the mare would hit the end of the rope that hard, and we were thankful she wasn’t hurt. I don’t think we told our parents about this misadventure until long afterward. Needless to say, we didn’t try that method again. We resigned ourselves to just being patient and trying to catch Nosey with grain and a halter. so we could use her for riding range.